Well, it had to happen, book No 7 was destined for book club reader Judith but when I popped round with her brown envelope (see post about book No. 5) she was out. Luckily, hubby John was in and as he is also an author, he was very interested to see my book in the flesh. Even though we are all babes of the digital age, you can’t beat the impressive feel of something solid in your hand! 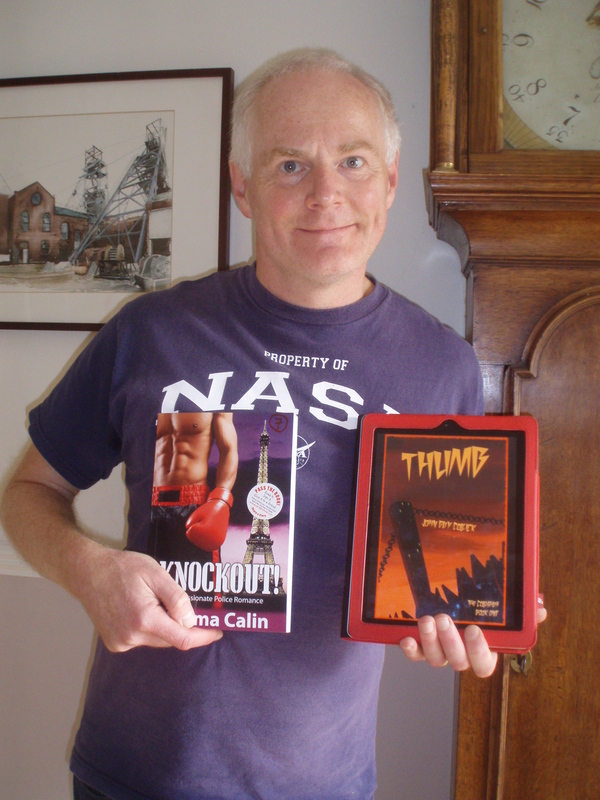 He is currently awaiting the imminent return of his book THUMB from the editors so could be pressing the publish button very soon. You can see the provisional cover art for his book on the right – it’s gorgeous German Expressionist Style. John is currently writing a series of Science Fantasy and Fiction books – but he is already a well known academic and non-fiction author. His work can be found in the University libraries of the world. Judith is also very clever she is a teacher (so let’s hope the grammar is OK!). Luckily Freddie is foreign so you have to forgive him any errors. It is scary to think of this book moving in educated circles. 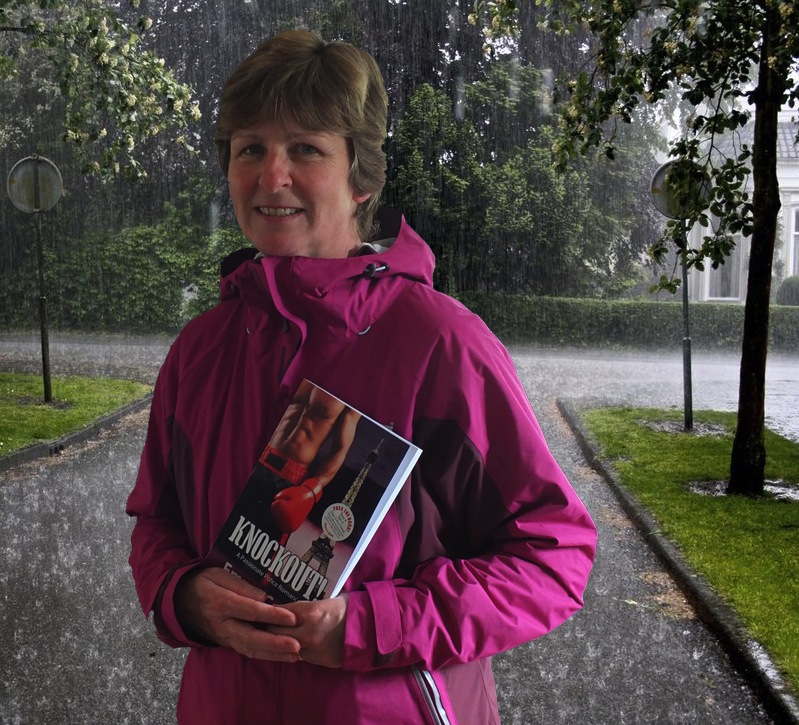 Debbie braved her way through the deluge to get her carefully wrapped copy of Knockout! for her holiday read. She is counting the days til she escapes to hot sunny Greece. All that rain followed by scorching sun – it’s sure gonna be a steamy read! Starter Star No 5 is Christina (& David!! ) – she fancied the “Perfect Poolside Partner” ready for her hols. Let’s hope she’s not disappointed! 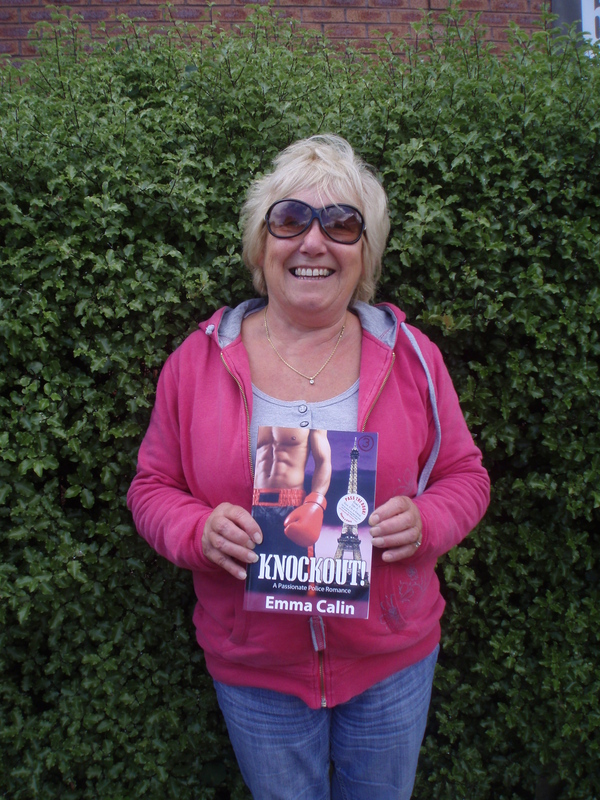 Book number 4 is now in the hands of Lucienne – a French lady who is very clever and reads English. She is keen to see if Freddie lives up to the traditions of French lovers. 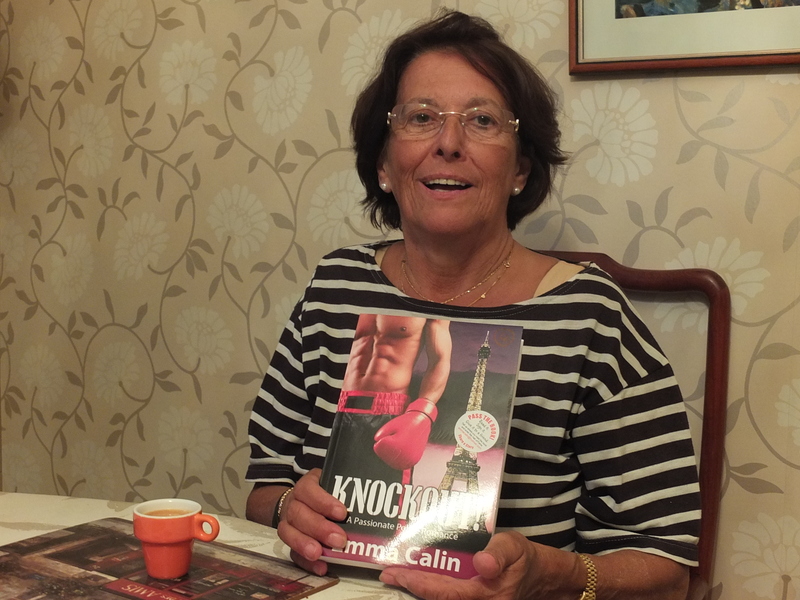 This is Marian – she has got copy no 3 of passionate romance by Emma Calin “Knockout!”. Marian works with special needs children and keeps them happy and under control on their journeys to and from college. 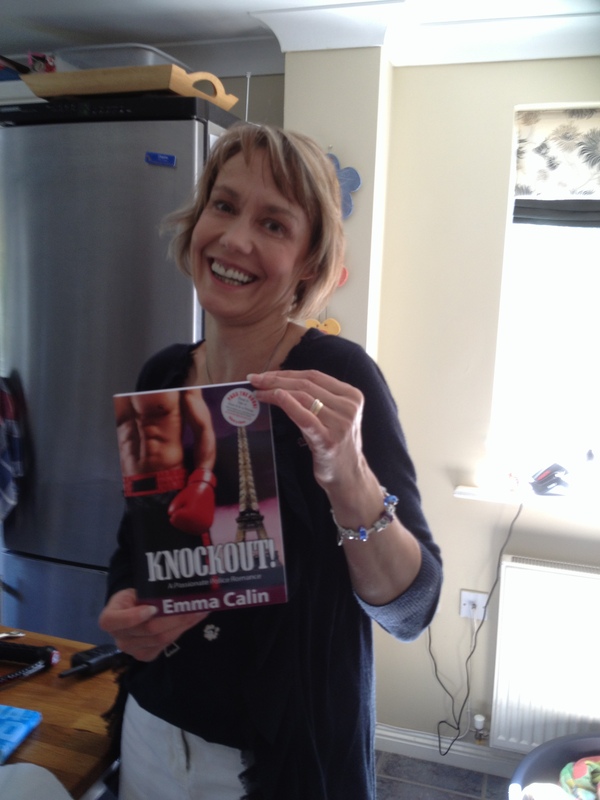 The second PASS THE BOOK copy of Emma Calin’s Knockout! A Passionate Police Romance was also taken by Kate – she has many colleagues and one edition was just not enough to go round! 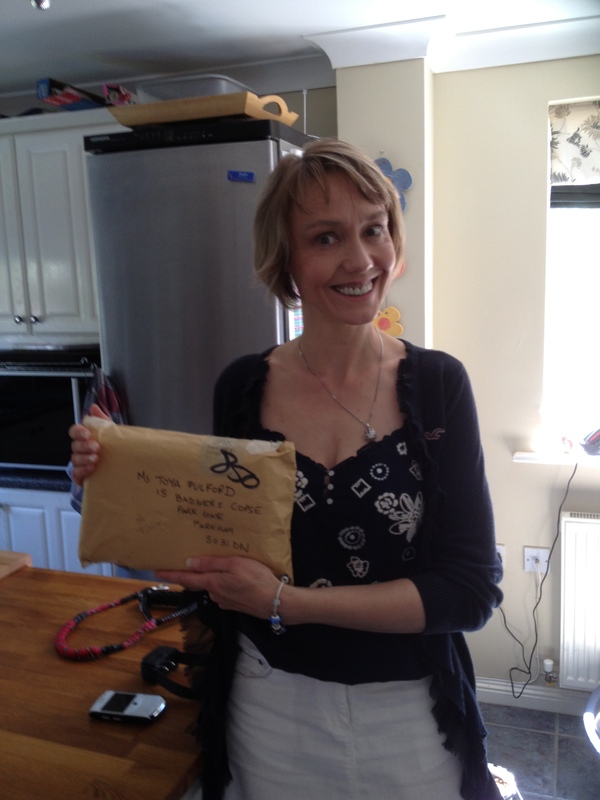 The very first PASS THE BOOK copy has been taken by Kate in Eastleigh, Hampshire. Kate is a nurse and works very hard – she loves to curl up with a good book to relax. 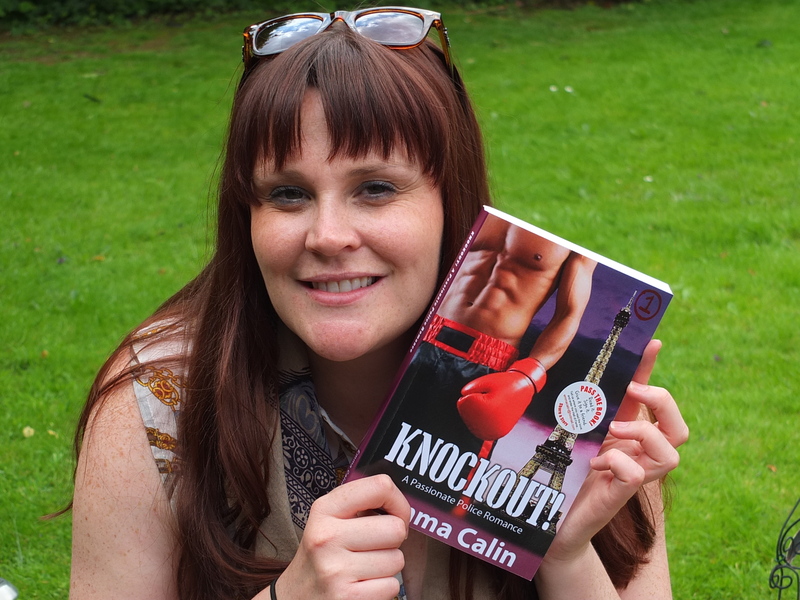 She says her colleagues are looking forward to getting their hands on this steamy romance – Knockout! by Emma Calin. The stickers finally arrived, so the first set of 10 books have been labelled and numbered. Which book is it? 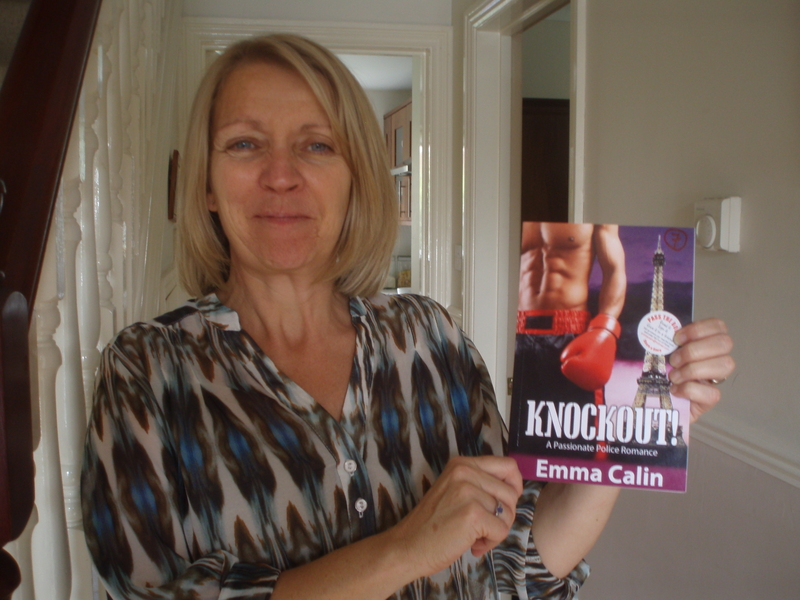 Well, it had to be my very own: Knockout! A Passionate Police Romance. The Pritt stick has been out and the instruction plates glued inside the front covers, the back pages have been marked up with columns so our readers can leave their comments. It felt very strange writing in brand new pristine copies – my kids were horrified! Before the glue was dry, the first 3 books disappeared out the door to our very first STAR STARTERS. Two books have gone to some lovely nurses and a third has gone to a lady who escorts children on a school bus. You can see their photos on the Hall of Fame galleries for Knockout! Books 1-3. Well, here we are poised to launch the first PASS IT ON book sharing challenge. I am very excited! As soon as I have the photos I will post them here.